The Small Object - I wanted to walk away with the entire booth. Her short flat folk drawings caught my eye. 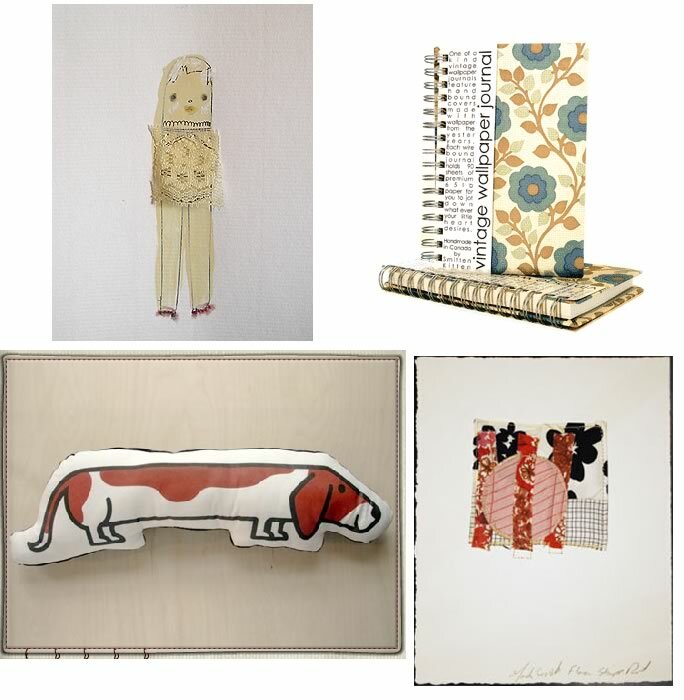 Smitten Kitten - Great wallpaper journals and goodies made from vintage papers, all the way from Toronto, Canada. Then there's Pillow, Pillow, Pillow - Fun animal pillows, mostly dogs and kitties from what I could see. Really well made. And art! We must have wall art! 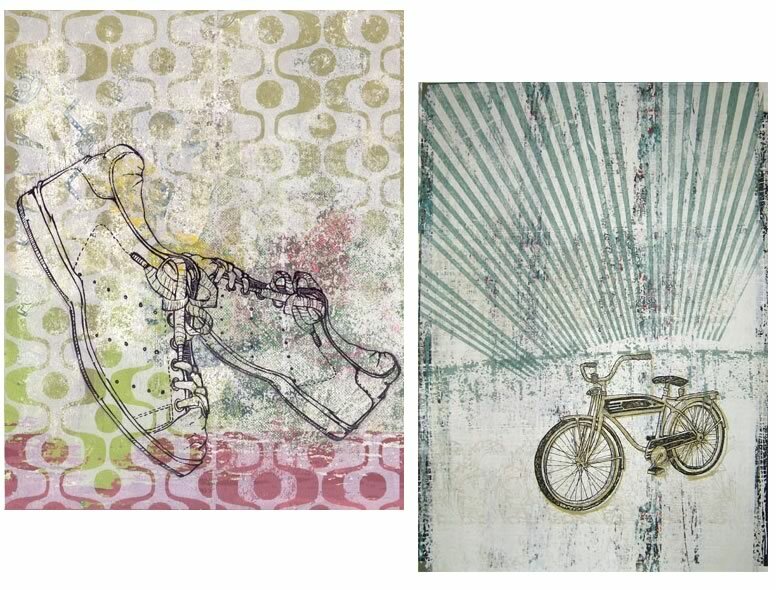 Mandy Gerth - Dreamy collages on paper with fabric. Another booth that I could easily have blown a paycheck. I hope she adds them to her etsy store soon. 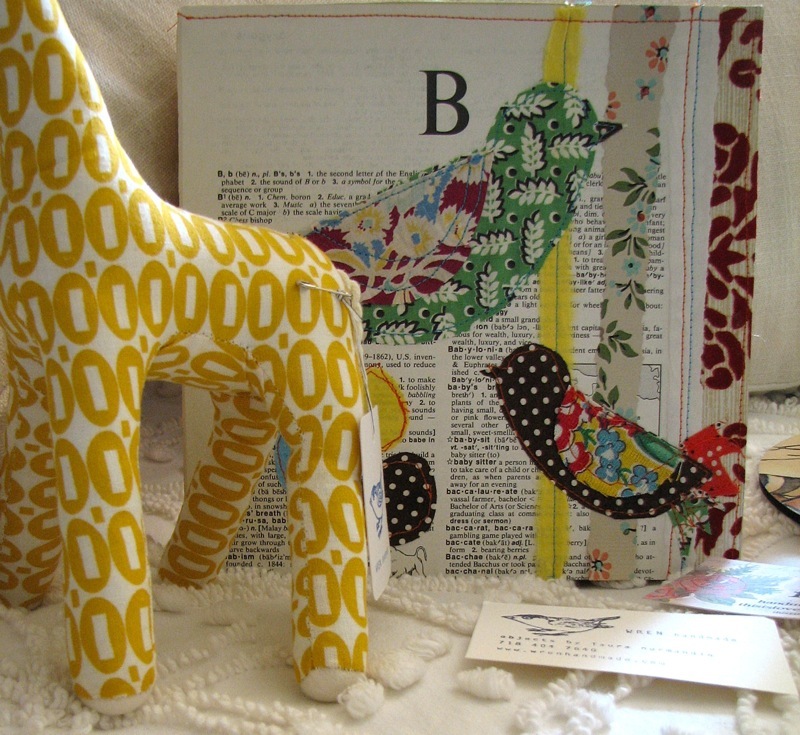 Wren Handmade - I grabbed a yellow and white giraffe from Laura Normandin. Really cute elephants, too. I'll show him to you when I'm back on Monday. Really cute things at this booth. Then there is Fernanimals, some of the sweetest mini lions in the world by Ashley Anna Brown from Beverly, MA. I spotted mostly lions, maybe she has other animals as well, but these little guys were adorable. Some had detached hoods. Really sweet. 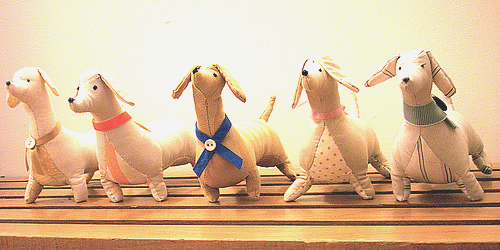 Sian Keegan - Adorable soft toys and things. Her daschunds were my favorite. Serigraphie Cinquenquatre - Alice Jary from Montreal came down with her prints, don't miss this booth, if you can secure a place around her table to look at them, that is. Her booth was packed with shoppers galore. From what I could tell, Alice is a big hit! Lucy's Vintage - This booth was a vintage lovers dream. I could have lingered much longer! 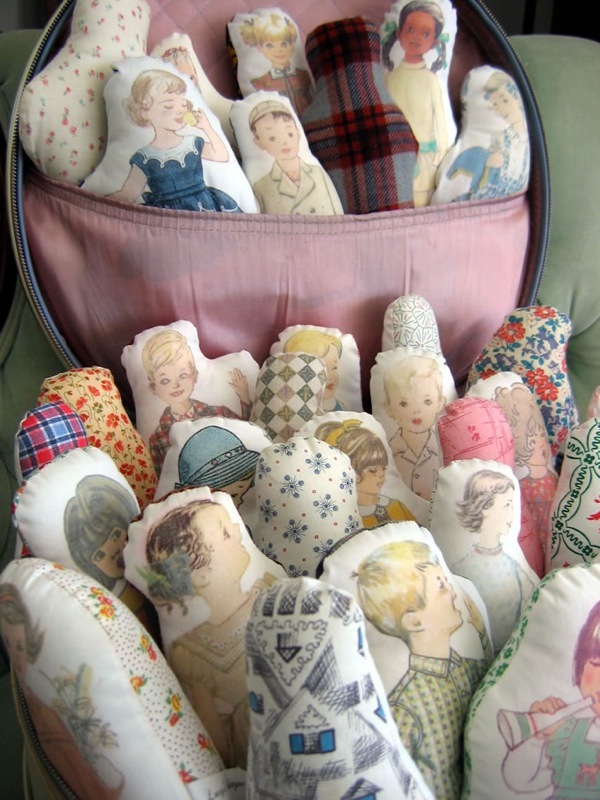 Her dolly pillows reminded me of the ones that my mother and auntie made for me as a child. Everything in this booth felt like it had a story to tell. So pretty. Lots of things available in her etsy store, too. Then there was Love Forever by Kayte Terry. Her lavender sachets and brand new art is really great. I heart Kayte. :) And Marilyn Patrizio rocks as usual. Until today, I'd only viewed her softies online. In person, they are even more adorable. 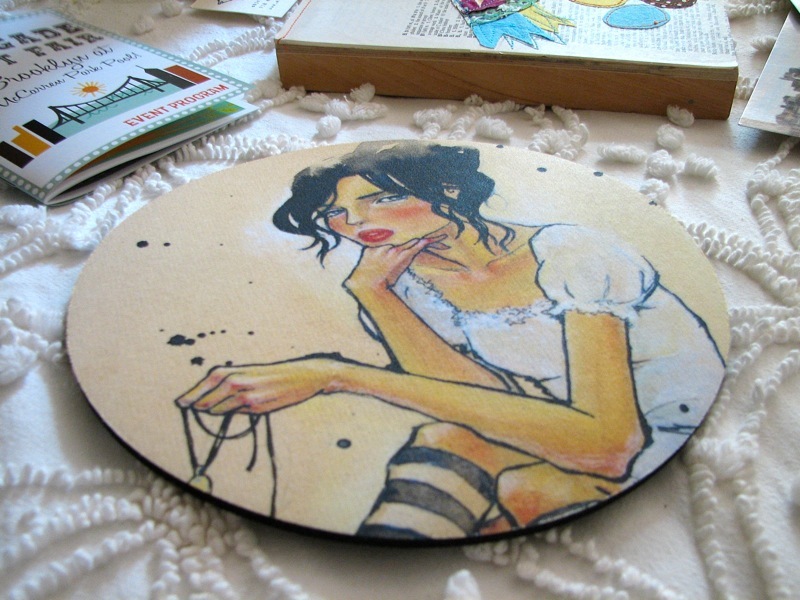 This girl is so talented, she is into so many things, from painting to graphics and sewing. Here's a link to her cutie blog, too. Oh and a new girl I discovered, Kim Design - Totally great knit and crochet goodies. Check out her website. And of course my usual favorites: Strawberry Luna, Fred Flare, Adorn, Magpie, Jen Corace, Jezebel, My Paper Crane, Figs + Ginger, If'n Books, Etsy, and Repro Depot (fabrics by the pound - weeeee! ), and 200+ more. 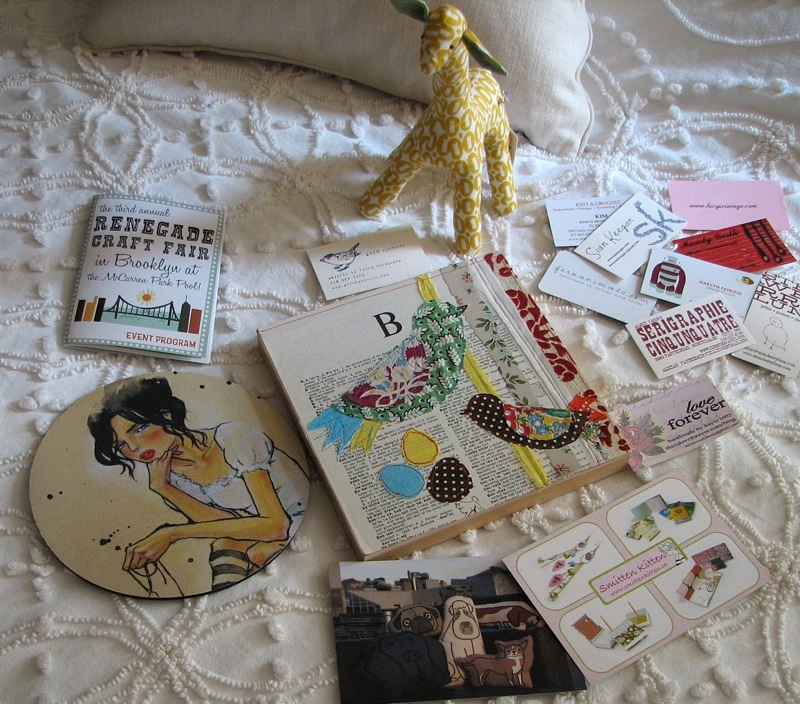 All in all, this was the best craft fair of '07 for me. I'm so glad I attended my first Renegade! Psst: If you do attend tomorrow (Sunday), bring cash because most vendors do not accept plastic. And brings lots of cash because you'll want to buy everything at this fair, trust me. It's delicious!